In the last post I mentioned that I pulled about 35 boxes of honey this year. Happily I was able to pull those on nice warm days. The moment I finished, the rain pulled in. But I was inside the nice, warm 85F (30C) extraction room. A side note: I extracted about 2 weeks ago, but I didn’t have time to post at that time…so, I’m playing catch-up with the posts. I mark my boxes with pieces of tape as I bring them in. 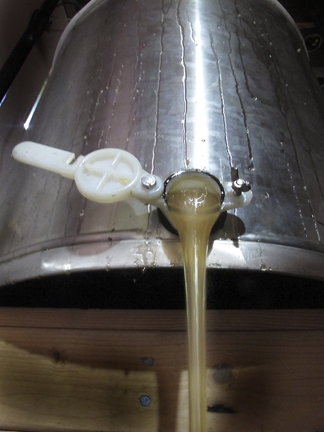 No tape means the honey came from the “down river”, agricultural area, hives. Blue tape means they came from the “up river”, forestry area, hives. I always extract the up-river honey first. It’s a lighter honey that included fireweed, thistle, and big leaf maple. The down-river honey is darker with raspberry, blueberry, blackberry, brassicas, and other agricultural crops. As you can see by the above image, my extraction room is small: 8 feet by 8 feet. It works for me, and it is easy to keep warm. At this time I use a decapping tub and a hot knife. But I don’t use them in the normal way. It hurts my wrists to hold up a frame of honey and cut down towards the tub. 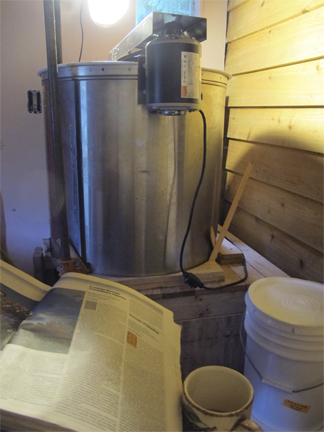 So I clamp two clean pieces of wood to either side of the tub, leaving just enough space to fit a honey frame. 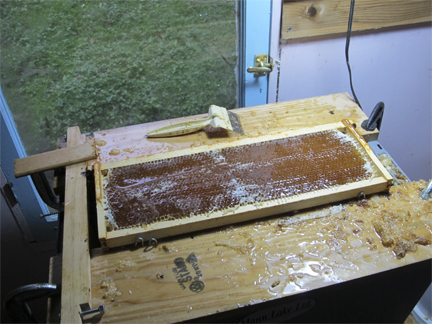 Then I place the frame of honey on the over the opening. Using another clean piece of wood to guide the tip of the decapping knife, I use both hands to draw the knife along the frame. Rather like a two-handed plane. This works well for me. The honey is uncapped and my wrists don’t hurt. It is a good size for my operation and for the size of my extraction room. 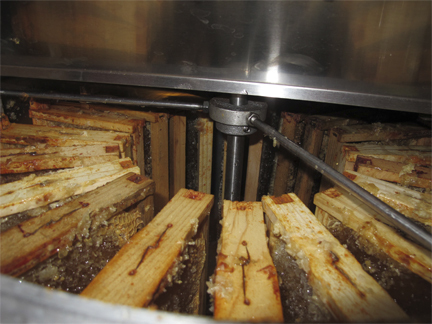 It usually takes about fifteen minutes for the honey to be fully extracted. Now, anyone who knows me might think: “Bean is sitting still for 15 minutes?!!!”. But it does give me a moment to catch up on world news. The newspaper in the shot is the Guardian Weekly. Which, if you’ve not read it is a brilliant newspaper that combines the Guardian, the Washington Post and Le Monde. It took me four days to uncap and extract this year’s honey. 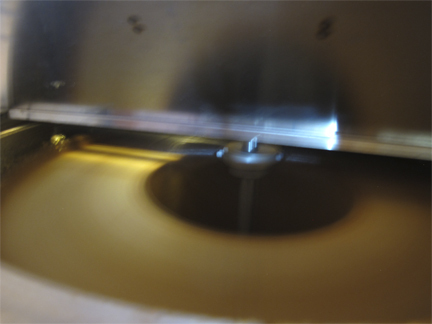 Each 20-frame load took nearly 2 hours to prepare, and fifteen minutes to extract. Which is an inspiration to search for a nice, small, decapping machine. So if anyone has any suggestions, please let me know. It started raining when I started extracting, over 2 weeks ago. Since then we’ve had 2 days of nice weather. 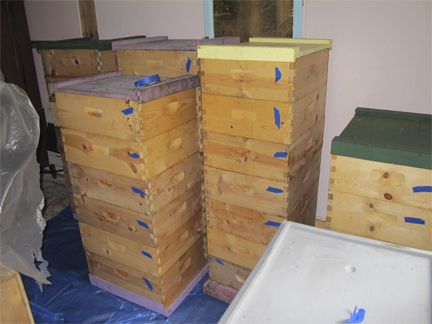 During that time I ran around to all the hives to start to prepare them for winter (and grumbled about the weather). More on that in the next post – the preparation, not the grumbling. 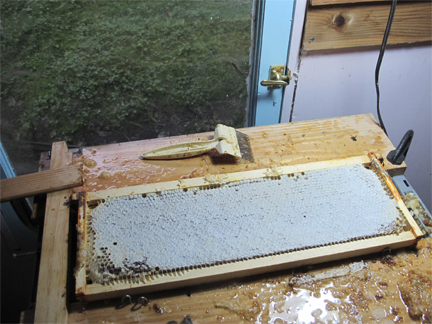 This entry was posted in Beekeeping, Honey and tagged Brookfield Farm, extract, extracting, extractor, honey, Maple Falls, Maxant, Washington. Bookmark the permalink.